You’re pacing up and down endless aisles of a Big Box Store in search of the last item on your list. You found everything else thirty minutes ago, are running late for a get-together with friends, and decide—after not being able to find any employee help—to give up… because who needs that last item anyway? Even if it is toothpaste, you can improvise, right? You can probably squeeze just enough out for one more go. But what if that last item on your list were something really important? What if that list is your Wedding Checklist and that item you can’t find is your Wedding Gown? Can you improvise there? Even if you can pull that dusty prom dress out of the back of your closet and—it’s a miracle!—it fits, can you bring yourself to saunter down the other kind of aisle to your excited-but-nervous beloved in… the flamingo pink ensemble with sleeves bigger than your head and ruffles in all the wrong places? The answer to that is probably “no,” so why run up and down the aisles of big box stores looking at generic dresses that aren’t actually what you had in mind when you could simply start somewhere that does have what you want. That somewhere is Christa’s. The reason you don’t feel rushed at Christa’s is that your bridal consultants at Christa’s are excited to help you find The Dress! Your consultant is there to help you with whatever you need and—at Christa’s—there will never be a time when you’re waiting in the dressing room for upwards of an hour for your next dress. The Christa’s Girls are a fabulous team of women who are ready to help. They first listen to the styles you’re interested in, the possible wedding themes you’re considering, and any other details that could lead to the perfect gown. They then go and pull gowns for you from our extensive stock (often one or two from each silhouette, if you’re not sure at first which direction you would like to go). Your Christa’s Consultant is by your side through the entire wedding-planning-process. You can call and ask for your consultant directly at any point and they’ll be happy to help in whatever way they can (our consultants have even been known to research wedding etiquette for garters, bouquets, and ceremonies for our brides!). You can count on the same helpful faces every time you come in with a need or want, a question or concern. The Christa’s Consultants are excited, attentive, and ready to be of service! Christa’s is also a one-stop-shop! Christa’s has everything you need on your Wedding-Attire-Checklist, and we know the best Wedding Vendors for everything else on your Wedding-Checklist. 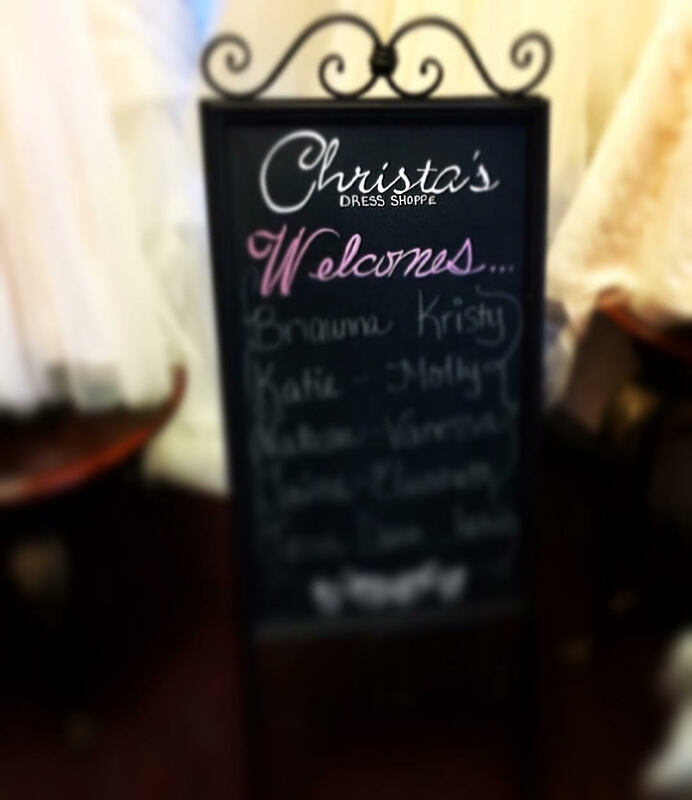 Christa’s carries—in store—wedding gowns, bridesmaid dresses, flower girl dresses, tuxedos (both for purchase and for rental! ), veils, jewelry, wedding novelties (such as the cutlery sets for cutting the cake and monogrammed champagne flutes), shoes, men’s and women’s accessories, wedding party gifts, aisle runners, and on and on! And because of Christa’s dedication to customization, everything is able to be styled completely and uniquely to you. So skip the big box stores next time and come straight to Christa’s! You’ll be glad you did.